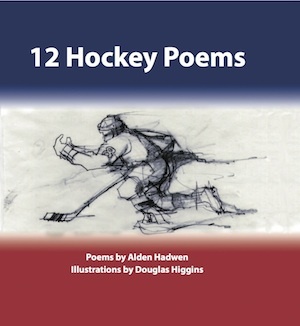 Alden Hadwen is the author of 12 Hockey Poems, a Canadian book of 12 poems paired with original drawings by Douglas Higgins. These poems capture how it feels to play hockey. They talk about winning and losing, and sharing stories with teammates on the bench. The poems describe different kinds of players, so familiar that we all recognize them; the Captain, the defenseman, the ‘firefly forward’. One can almost hear the sounds of the skates on the ice and the puck hitting the boards. Beautifully illustrated poems about the experience of playing hockey - from the young adult on-ice perspective. Especially suited to high school, college and university experience, or ideal for anyone who loves the game. To find out more about it, please contact aldenhadwen@hotmail.com.